The national park which encompasses three states of Pahang, Kelantan and Terengganu, is one of the vast verdant ecotourism hotspots among travellers to Malaysia, a home to great diversity of flora and fauna of Malaysia. Our tour packages will allow you to walk into the wilderness, taking in all the wonders the tropical rainforest in the East Coast of Malaysia has to offer. As far as travel agencies in Malaysia go, few can make ecotourism travel in Malaysia and your vacation as memorable as we do. The self-drive program covers part of major attractions in Malaysia with a wonderful journey from the historical places to the modern city and beautiful Island. The beauty of the East Coast is unsurpassed. With a first class accommodation at Tanjung Jara Resort, this is ts a great combination for a fantastic beach holiday. The resort is expansive and it is ever so relax & peaceful. From the wonderful stay at Tanjung Jara, we travel south to Kuantan for an overnight before the journey into the million year old forest in Taman Negara. The boat ride & jungle trekking is an exciting adventure for many. We end the tour with a visit to an Elephant Conservation Centre. This tour is for everyone and it is nicely paced for all to enjoy. This soft adventure programme attracts alot visitors to the National Park. The activities are fun & educational. Although the programme is suitable for all ages, a reasonable fitness is required to do the trekking. But you can opt out on the long trek and just enjoy the beauty of the sights & sound of the rainforest. The country’s location on the Australasian cross-migratory paths also makes it a host to 120 or so migratory birds. With over 600 species to be seen in the Peninsula and about 580 species in Malaysian Borneo, it is no wonder Malaysia has emerged as a bird watching haven. 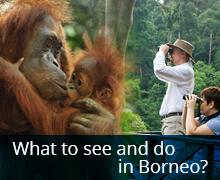 Travel Agent in Malaysia, especially for Borneo Holiday Tours. All rights reserved. All information in this website is subject to change without prior notice.